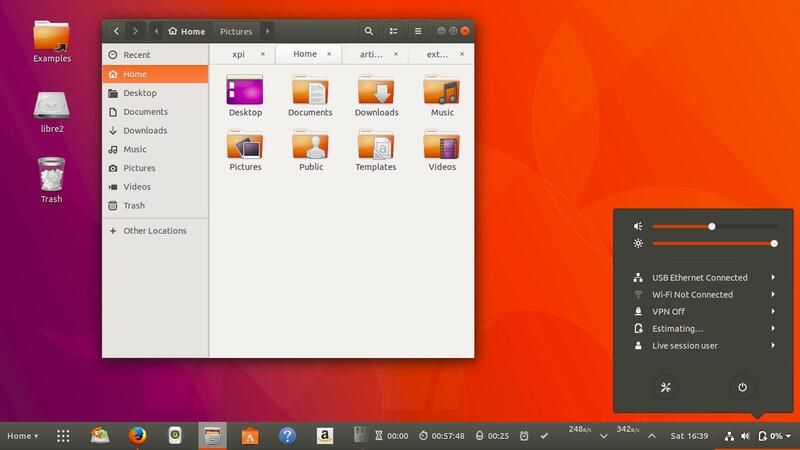 This is a list of GNOME Shell Extensions (GSE) that are very useful for Ubuntu 17.10 users. Among them are NetSpeed (to show up/down speed), Dash to Panel (to combine all panels into single bottom panel), Datetime Format (to show complete day-date-clock at top panel), even EasyScreenCast (to record your desktop activity to video), and more. They are handy for many user's daily/repeating tasks, easy to install, and user-friendly to operate. Finally, I hope this recommendation article is useful for you. Enjoy! 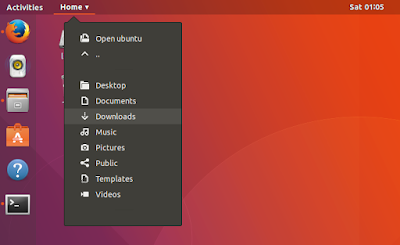 If you're new in Ubuntu 17.10 and don't know how to install GNOME Shell Extension (GSE), don't worry, just read our GSE Installation Guide. 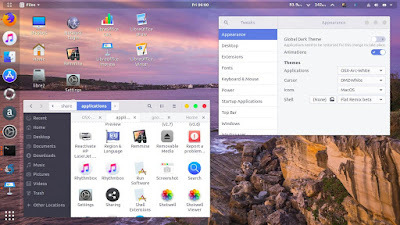 To give you basic picture, you'll need special program called GNOME Tweaks, plus additionally some small programs, then you're ready to 'hunt' GSE mentioned here. Indicator showing internet upload/download speed. Personally, this one is my number one favorite among all extensions. 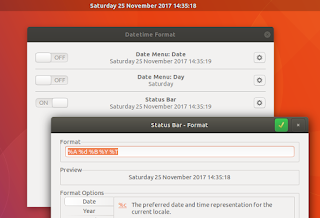 To show complete/custom date-clock format at top panel. 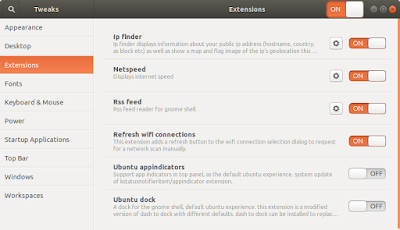 Once installed, you change the time format using GNOME Tweaks in "Status Bar" section. See picture below, I used format code '%A %d %B %Y %T' so my date format changed into 'Saturday 25 November 2017 14:42:09'. It's an excellent extension! Were you KDE and Windows users? You liked the bottom-panel-for-everything? You disliked top-panel at GNOME 3? Then the answer is this extension. It removes top panel, and combine all items on a new bottom panel, just like panel you found at KDE and Windows. 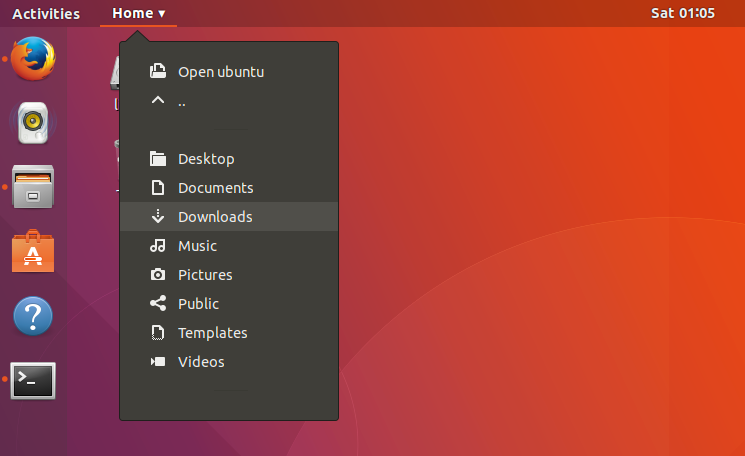 I recommend this for you distributing Ubuntu/GNOME at schools, universities, and offices especially when the students/employees were previously Windows users. 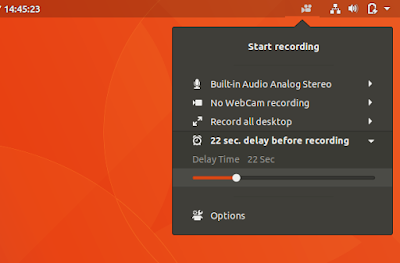 Desktop recording program that is very user-friendly! 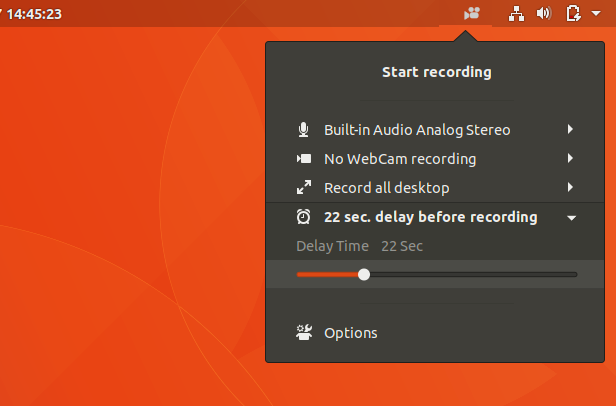 You can record desktop screen activities + your voice into video. You can save video as WEBM, MP4, MKV, and OGV formats. 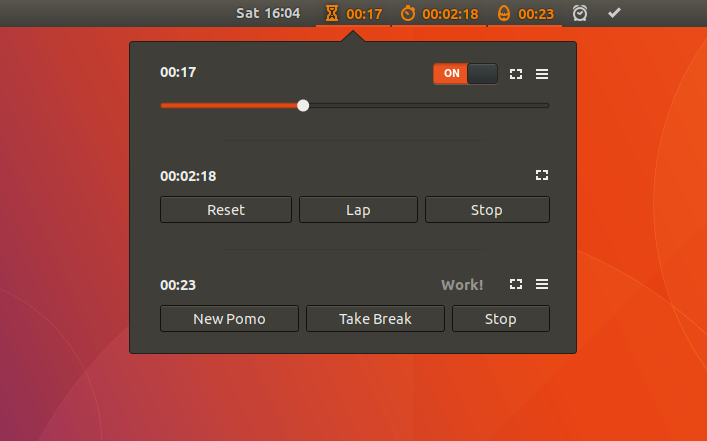 Timer, alarm, stopwatch, schedule, and Pomodoro, in one program. It's very user-friendly. Very nice for you for time management. Handy news indicator right on the top bar. You can read latest headlines from blogs/websites you love easily. Read our long list of RSSes of many GNU/Linux-related websites. 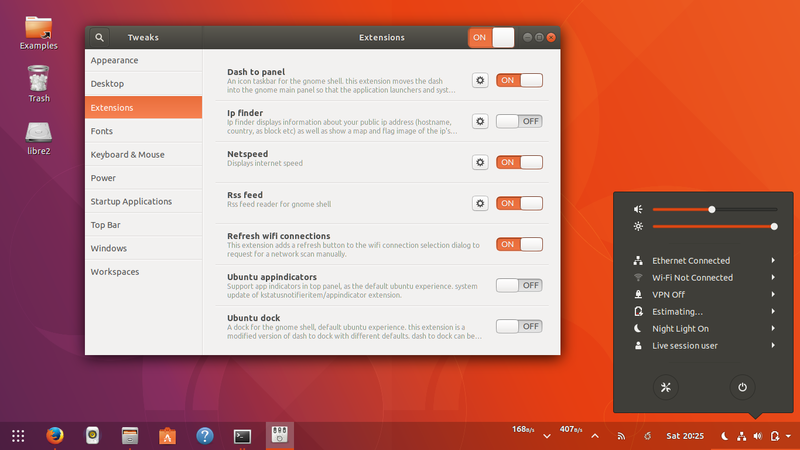 To enable GNOME Shell Theme installation via GNOME Tweaks. Read more at Desktop Theme Installation Guide. Adding a 'Refresh' button at WiFi Networks selection. 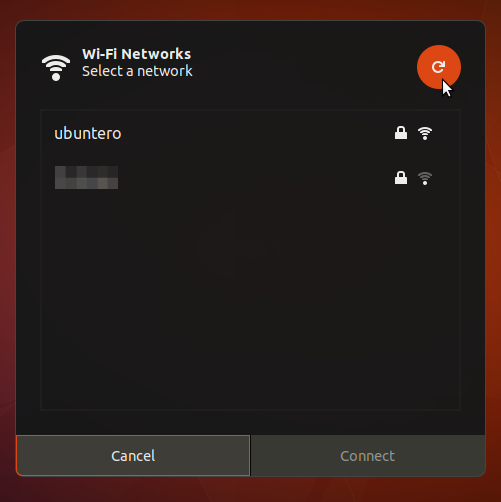 By default, GNOME doesn't give you this handy button, but once this installed, no more clicking disconnect-reconnect to reset connection or find wifi hotspots. History of all of your copying (Ctrl+C) activities, keeping texts (commands, paragraphs, poems, and everything else) you've been copied. If you ever used the same tool at Kubuntu/KDE ('Klipper'), then you know how useful it is, for example: to remember what commands you've copied or to recover important text/document you failed to save (but have been copied) previously. 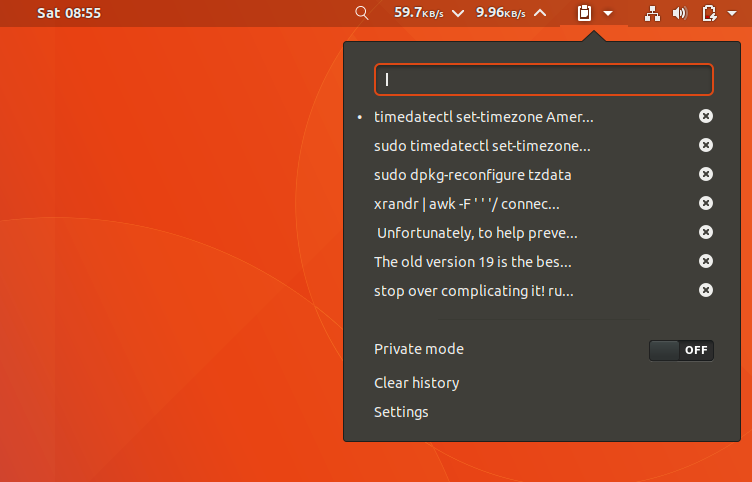 Small browser as well as a quicklist to access Home folders + the files! Imagine how useful it is to open files such as PDF, DOC/ODT, XLS/ODS, PPT/ODP without opening file manager.